By this time, I have a favorite bakery, a favorite butcher shop, a favorite vegetable souk, a favorite hanoot, and a favorite place to get rghayef with amlou on a Saturday morning. Two weeks ago, I found my favorite egg store. You can find eggs in some hanoots, souks, and the mini supermarket. But this is a shop that sells eggs, eggs, and only eggs. A garage door opens into a small room full of brown eggs in open gray cartons on tables, sorted by size- small, medium, large. I never knew chicken eggs came in different sizes, but they definitely do. I approach the crowd of grand taxis parked outside the bus station, and say to the man with the small notebook and pencil- in Darija, exactly the way I’ve heard Moroccans say it- “Tangier, one seat,” pronouncing Tangier the Arabic way. The man points toward a grand taxi. I hand him thirty dirhams. He asks me something in Darija, something I don’t understand. I look at him quizzically. I’m not French, but I don’t bother telling him I’m not. You find a language in which you can both communicate adequately and you go with it. That’s how it works here. I’m not often mistaken for a Moroccan woman. I assume it was knowing the grand taxi system that made him think I was. People generally assume I’m Spanish or French. I’m buying vegetables in the souk. “Are you Spanish?” asks the man selling me half a kilo of tomatoes. “Buongiorno!” shouts a random man on the street. Well, that’s a new one. The funny thing is, he’s closer than anyone else. Two friends and I hail a taxi in the touristy marina district of Agadir. We tell him our destination through the front passenger window. “Fifty dirhams,” he says, in French. We get in the car. He turns on the meter. We chat on the ride home, telling him we live in Morocco, we’re teachers, we’re visiting a friend, asking him what he thinks of Agadir. His tone has completely changed. We’re chatting like old friends. He gives us his number in case we ever need a taxi and can’t find one. When we reach our destination, the meter reads twenty-nine dirhams. I point to the meter. “Look. Does it say fifty? Does it?” I can’t resist. My city is small, and people are starting to recognize me and realize that I live here. I’m that American girl. I’m not a tourist. I’m here to stay. And I now have a growing collection of unofficial Darija tutors holding me accountable for my progress, in the form of Maroc Telecom employees and vegetable vendors. I walked into Maroc Telecom to pay my first internet bill. I didn’t think the man behind the counter recognized me, but he did. (Not the Bob Marley fan who drilled a hole through my wall. A different Maroc Telecom man.) I handled the whole transaction in French, because when it comes to money I don’t want to take any chances. And because, let’s be real, French is easy and I’m lazy. It may have just been small talk, but I interpreted that as a “Use Arabic next month, when I see you again.” Homework assignment duly accepted. I was buying beets in the vegetable market a couple days later. “Cinco dirham,” said the young man behind the counter. The guy at the next vegetable stand shouted over, “She speaks Arabic!” And the conversation switched to Darija. They thought this was hilarious. I went to my university’s copy center today and walked out later with exactly what I wanted, after communicating only in Darija! This was a big Morocco step for me. “Hello, [my name]!” Whoah, she remembers me! I guess I am the only American around here, after all. I’m a zoo animal. I have four… four…” Quick, how do you say files??? Wait, nevermind, it’s ok, she understands me. “Yes. I don’t know how many students I have… [I was SO proud of that sentence, just sayin’] … but fifty, please.” Most likely I will have closer to a hundred per class, but from what I’ve heard, many of them will not be there on day one. On top of all this, I got my schedule today. A real life actual schedule, with classroom numbers and everything, formatted specifically for me, and in English. Wahoo! There’s this Darija phrase that I thought was just another way of saying “hello.” I just found out a few days ago that it actually means “good morning.” For the past three weeks, I have been cheerfully telling my neighbors and the local hanoot (shop) owners “good morning!” at 8 or 9 pm, and none of them have ever corrected me! When I lived in France, most of my conversations happened in my second language (French) and the other person’s first language. When I was working with Spanish-speaking newcomer students in the U.S., most conversations happened in my first language (English) and the others’ second language. Here in Morocco, I often have to rely on my second language and the other person’s second language. At my university the other day, my department head introduced me to the Dean. His English wasn’t great, my Arabic was barely there, so we quickly switched to French. We understood each other perfectly. But sometimes, when you’re both speaking your second or third languages, communication errors happen. The other day, I went to a café and asked for a coffee and a “pain au chocolat.” Now, in France at least, “pain au chocolat” refers to a chocolate croissant, but literally it means “bread with chocolate.” The waiter brought me exactly that. Four slices of bread covered in generous amounts of nutella. I wasn’t gonna complain, though. It was delish. My roommate burst out laughing. Someone had posted on Facebook, “Before you marry anyone, watch them use a slow internet connection and see how they deal with it.” Too real. Way too real. For the past three weeks, my internet connection has come from this tiny device called a dongle. It’s better than nothing, and it works well enough when it decides to. But more often than not, it is slow enough to test the patience of a turtle, if it even works at all. 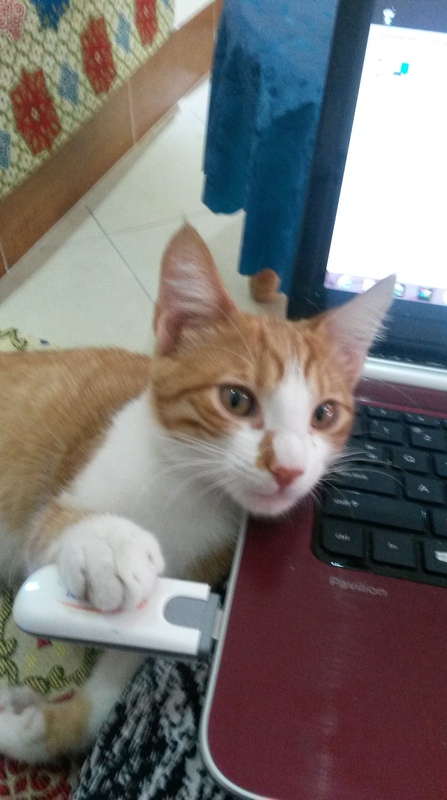 Buy your dongle now and Maroc Telecom will even throw in a free cat! Just kidding. At the “Centre,” there was one spot on the property with wifi, a small square of patio just outside one window. Any time we were not in Darija class, we could all be found there- the ten Americans, huddled together next to what we came to call “le wee-fee wall.” I’m sure the guards thought we were nuts. To get a wifi router in Morocco, you need either a carte de séjour (green card) or a copy of your lease. I found a French-speaking employee at the nearest Maroc Telecom store, signed a twelve-month contract, and walked home with an ADSL router and modem and no idea how to set it up. But it couldn’t be that hard… right? Wrong. My apartment has no phone jack. So it was back to Maroc Telecom the next day. I spoke to the same employee in French, but he did not seem concerned. No worries. They’d send a technician over to my apartment later that day to set everything up. My phone rang a few hours later. A man’s voice speaking Arabic. Someone from Maroc Telecom to set up my router. Which floor was I on? No, he said, he only spoke Spanish and Arabic. Okey-dokey. This is gonna be interesting. Thankfully, Moroccans are incredibly kind and understanding when it comes to language barriers. I’ve never had a Moroccan respond rudely to my pitiful attempts at speaking Darija and Spanish. People always patiently try to understand me, they don’t laugh at me when I mix multiple languages in the same sentence, which I do on a regular basis, and they are always happy to teach me a new Darija word or two. “Si,” I said. I figured they knew what they were doing. He produced the biggest drill I’d ever seen and immediately began drilling a hole through my wall. Oh no no no, don’t let the neighbors tell my landlord about this! Then he was passing a cable through the hole in the wall from the roof. “Are you from London?” he asked me in Spanish. Me: Uhhh… ha, yeah, you got me. I don’t actually speak this language. Sometimes they guess my nationality/language in a different order. I like seeing what the first guess is. It’s always different. Brb, off to the hanoot to buy some water with my fake-it-till-ya-make-it Darija!